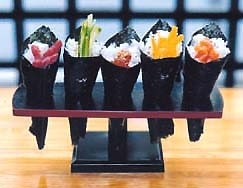 Global Maxlink Inc. is a primary importer of sushi nori seaweed. Established in 2002. Global Maxlink first opened its doors in Sacramento, California, to meet the rising demands of local Japanese distributors. Today, Global Maxlink Inc. is the premier direct importer of sushi nori in the western United States, providing the highest quality Sushi Nori to distributors, wholesalers, retailers, and restaurant groups. Seaweed was first consumed 1500 years ago, according to early written records. During the Asuka Era (600-700AD) and Nara Era (700-800AD) seaweed was only consumed by the Japanese nobility. Until the Middle Ages there was only wild seaweed, which limited it as a food source. During the Tokugawa Era (1600-1800AD), Ieyasu Tokugawa, the shogun of the time, ordered fishermen in the small town of Shinagawa to bring him fresh fish everyday. The fishermen built an offshore fence and started a fish farm. They also found that seaweed preferred growing on this fence. Thus seaweed aquaculture was born. Sushi Nori as it is known in Japan and the U.S.A. is made from several species of Porphyra seaweed that is carefully harvested from the rich seas that surround Japan. Other common names include Laver (English), Kim (Korea), Zicai (China) and Karengo (New Zealand). Production of Nori varies from year to year depending on weather and growing conditions. The seaweed is harvested at a depth of about 25 feet, washed, processed, and spread thin on special racks to dry. Once pressed, the Nori is then roasted to enhance its flavor and texture, turning into a brilliant green color.